Truly one of the great films, featuring one of the great, forgotten performances. 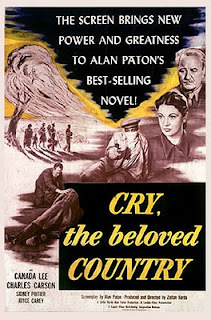 I have to acknowledge up front that I've never read Alan Paton's novel upon which this film is based, so I'm not weighed down by the burden of comparison. As pure cinema however, this is an incredible piece of work — subtle, lyrical, and highly affecting. Cry, the Beloved Country is a film about apartheid in South Africa, but its brilliance lies in how the film masks this within a moving and perceptive story of fathers and sons. It could be suggested that this is a film of opposites, and yes, of black and white. Of a white, racist father who finds an altogether unexpected sort of redemption when his anti-apartheid activist son is murdered by native burglars; and of a devout black minister whose life is undone when he discovers that it was his own son who pulled the trigger. This isn't a crime film or a courtroom film, nor is it a melodrama — although aspects of each of those kinds of pictures are present. Where this lingers is in metaphor, particularly that of the search. On the surface this film is about the search of the fathers for their estranged sons, yet it's through this microcosm that we come to recognize the larger struggle of a nation trying to come to grips with itself, as were are exposed to what life was like for black South Africans on the plantations and in the mines — as well as in the shanty towns. Our companion is the reverend Stehen Kumalo, played by actor Canada Lee. Known mostly for his role in Hitchcock's Lifeboat, Lee gives an astonishing performance. Rarely ever has an actor poured such emotion into such a reserved and dignified character. If for no other reason try to see this just for his work. He's accompanied by a very young Sidney Poitier, playing a fellow priest, in a role seemingly more indicative of Poitier's later career than his beginnings. Legend has it that director Zoltan Korda was forced to tell South African officials that Lee and Poitier were his indentured servants in order to get them into the country for the on-location filming. Lee's life in the months completing this film was tragic: called before the House Un-American Activities Commission, he was blacklisted in the wake of what the committee deemed unsatisfactory testimony. 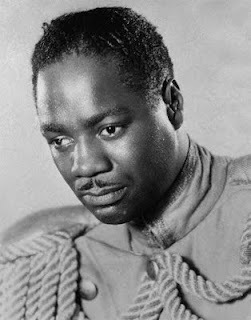 Broken, he died of a stroke the following year at age 46, with only five feature films to his credit. The film’s — and Lee’s — great moment oddly brings to mind Terms of Endearment, another film in which child and parent are forced to confront not only great pain, but the coming death of the child. It's only in this notion that the two films have anything in common, but while Shirley MacLaine tears up the set hysterically demanding her daughter's treatment, Lee keeps his back ramrod straight. MacLaine is famously, and appropriately, over the top in her scene. Her outrage comes in the face of the apathy and indifference she sees directed at her daughter's pain. Lee is denied any such entitlement. When his son finally breaks — on his knees and grasping at his father's waist as he cries over and over, "I'm afraid of the hanging!" Lee has no choice but to stiffen, keep his chin up, and maintain his dignity — as he knows his son must also learn to do. Both moments are heartbreaking, but it's easier to empathize with MacLaine. Despite the fact that Aurora Greenway and her daughter are so different, all parents know that the foibles of difference and personality are forgotten when the chips are down. Stephen Kumalo's challenge is greater: he is a man of God and his son is a murderer. Yet he must find a way to show a similar sort of strength at the crucial moment of his life. It's a shattering moment in the film. See this one, if you love movies you owe it to Lee. Excellent write-up, this one does actually sound quite great. I love blogs that expose me to some wonderful things I may not have heard of or seen, it's something I try to do as well, so I commend you for the great work! I'll definitely be keeping up with your entries over here, Mark. Thanks very much Drew, I appreciate the kind words! Thanks Kitty, glad you are here! A punch to the gut is an apt way to describe the affect this movie had on me as well -- all without being too obvious. 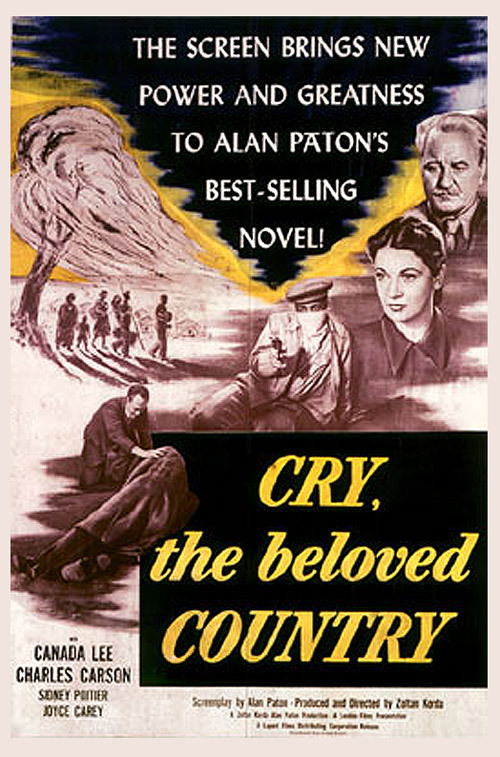 Hi Arthur, This has been airing from time to time on TCM. If you get the channel you might catch it there. Good luck, it really is a gem. HI, I read the book about 35 years ago but got around to see both the versions back to back only today. I hunted for a review after I was done and landed here. I am glad I did so. Thanks for the very good review.